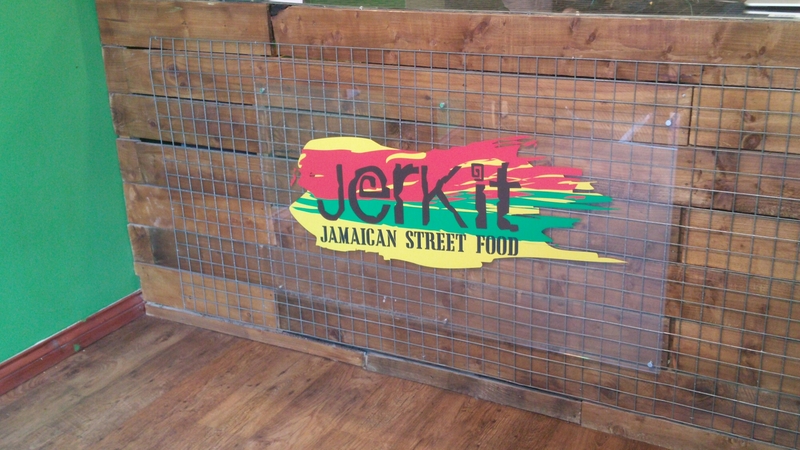 Jerkit is now a fully licensed sit down restaurant and take away rather than just a take away. 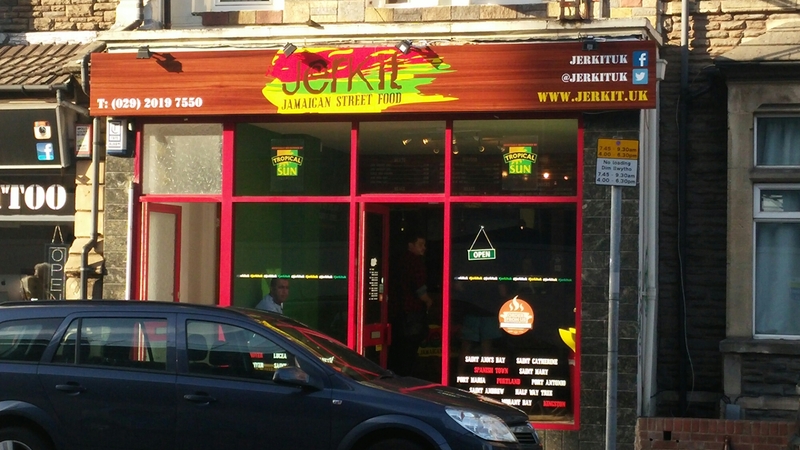 No l am not being abusive, the title refers to the Caribbean cooking style which uses “Jerk” seasoning and is much in evidence on the menu of the rather jolly “Jerkit Jamaican Street Food”, a takeaway in Cathays, Cardiff. Mrs SF and I don’t really do takeaways, with the last one we had (Hokkei) being back in December last year. On the night in question, however, neither Mrs SF nor I could be bothered cooking and I was knackered so didn’t fancy going out. With the continuing dreadful weather at the time, I thought something different in the form of a bit of Caribbean food would cheer us up a bit. 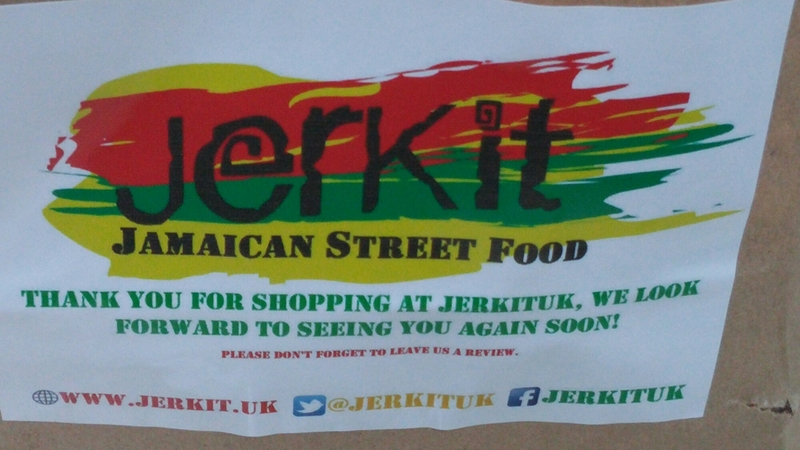 I therefore ordered on-line and took a detour home to call in at Jerkit Jamaican Street Food. Situated on Crwys Road (in the heart of studentville) in Cardiff, Jerkit adds to an already strong showing food wise (think Hokkei, Katiwok, Hellenic Eatery to name but a few). In terms of the space as it is really just a takeaway there is not that much to say, but I will anyway. The exterior is smart with some nice Jerkit branding and inside I love the glass counter top underneath which is filled with charcoal. On the takeaway front their online ordering platform (kukd.com) is a cinch to use and made the ordering process a doddle. You can pay online or with cash or card in the place. My order was ready within a couple of minutes of me arriving. As the title of the post and the name of the place strongly suggests “jerk” is the speciality of the house, with chicken and pork the mainstays but fish and even lobster also make an appearance. Add to this goat curry, brown stew (chicken stew, usually with flaming hot scotch bonnet chillis ), plus sides and you have what looks like a strong offering. Full details of the menu can be accessed by clicking here. and Mrs.SF went for the a large jerk (hot) chicken set meal. 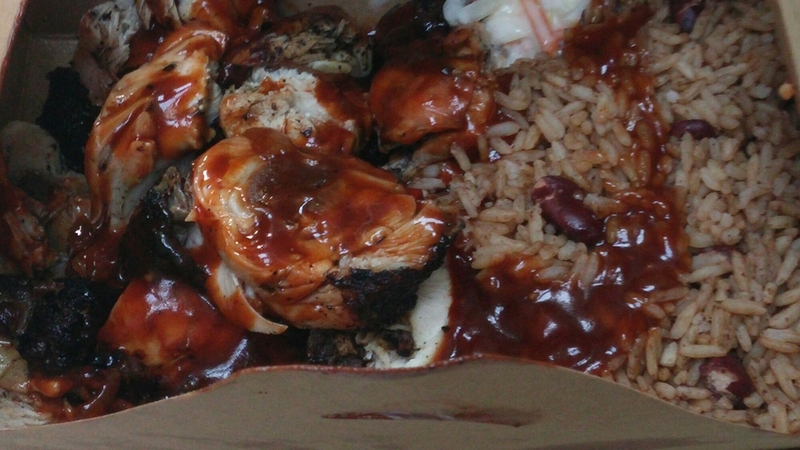 Both were jumbo portions and came with rice and peas and allegedly coleslaw (although the latter was a homeopathic portion – so small it barely registered), with enough left for lunch the next day. Mrs.SF’s chicken was (true to its description) hot, with chilli to the fore. It was on the bone and Mrs.SF did have to work somewhat for her supper in terms of extracting the meat off the bone. It was viciously chopped up in store before being added to the box and the result was a few stray shards of bone that could have been filling killers. Care was therefore needed. My jerk pork was significantly milder, chilli wise, than the chicken and as a result the spicing was more to the fore. It had a lovely blackened crust, with nice aromas of spice including allspice cinnamon, clove and nutmeg. The pork had a good amount of fat (where the flavour is) and was very tasty. 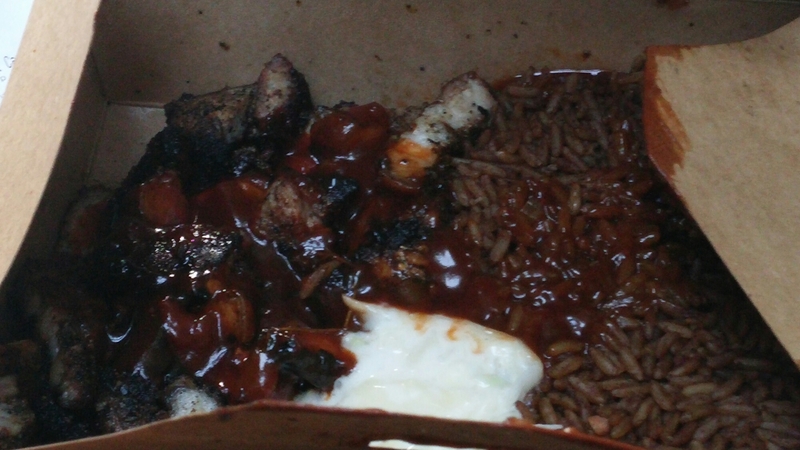 The rice and peas with both were also great, with lots of flavour (more so in the pork than the chicken I would say). and salt cod fritter (6 for £1.25 ) and popcorn shrimp (15 for £3). I wasn’t sold by either the popcorn shrimp or the salt cod fritters, if am honest. 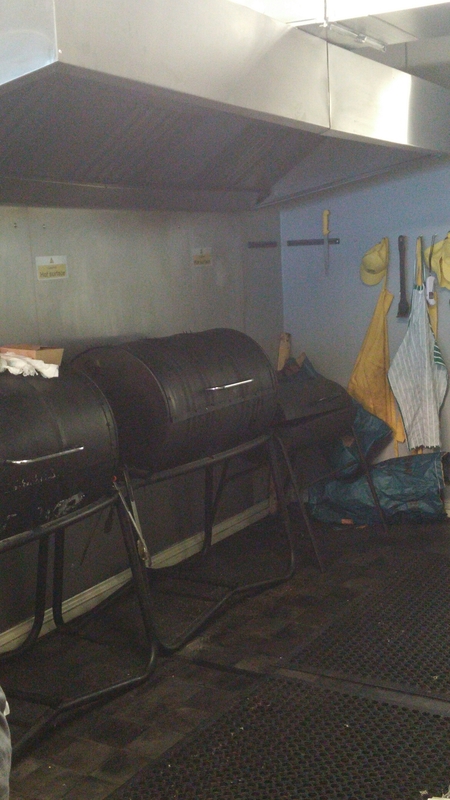 They were a bit greasy and soggy rather than crispy which suggest too low a temp on the fryer. 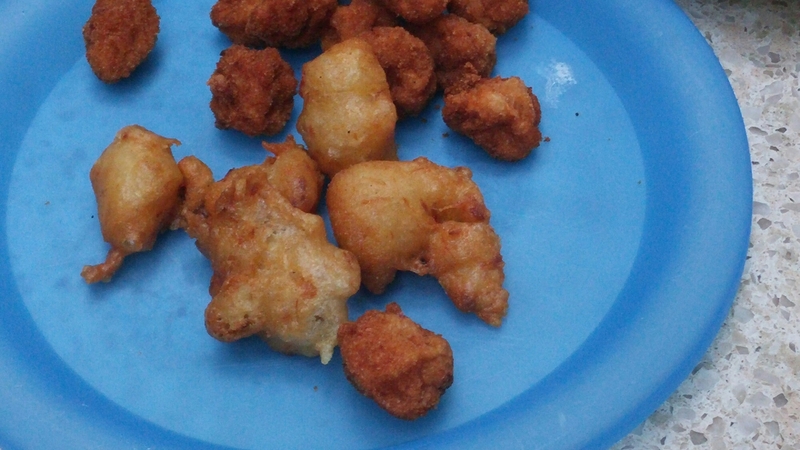 Also, strangely, I found the popcorn shrimp overly salty and the salt cod fritters a bit bland and under seasoned. Don’t think I would order either again. 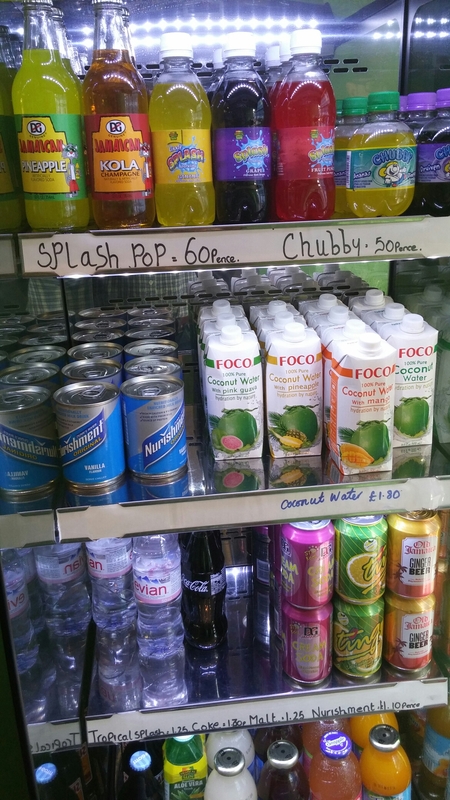 Being a takeaway the drinks options are limited but it was nice to see a good range of Caribbean soft drinks in store, including the rather alarming looking “Nourishment” which comes in a tin. 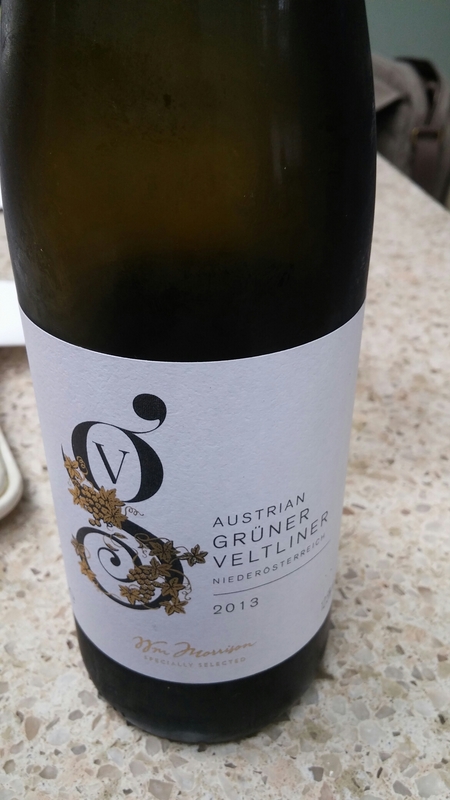 In terms of what to drink with the rather diverse flavours of jerk I opened a bottle of Austrian gruner veltliner which is built to cope well with chilli heat and spice. 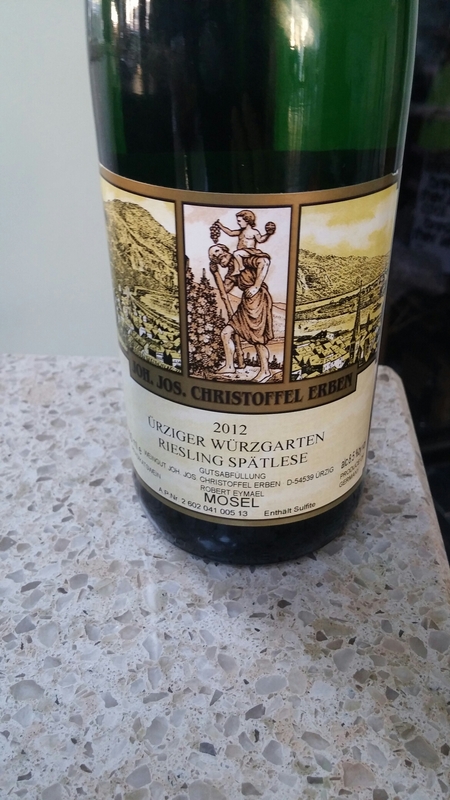 A German riesling would have worked as well. There is also, of course, the option of Red Stripe. I rather liked Jerkit. Great flavours on the meat and super value for the set meal boxes. £5.50 is a bargain for the amount of food in each of the boxes we ordered (bit more generosity with the coleslaw next time would be nice mind). We ordered far too much but the price all in (with the slightly disappointing prawn and salt cod sides) was £17.75 for two. This was excellent value in my opinion. For someone less greedy than me, I reckon you could eat well at this place for around the £5 a head mark. Would I go back? Definitely – good food at a cracking price always floats my boat. 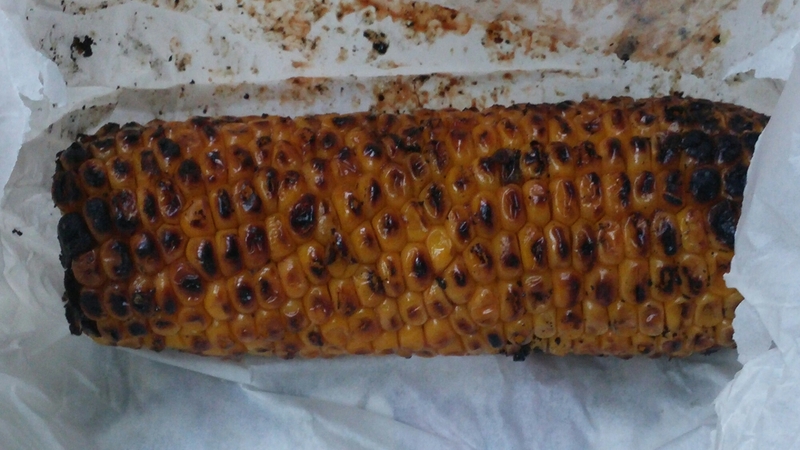 This entry was posted on Aug 9, 2015 by solicitingflavours in Barbecue, BBQ, Cathays, Drink, Fast food, Food, Jamaican food, Jerk, Jerkit, lobster, lunch, lunchtime, New restaurant Cardiff, Non alcoholic drink, Restaurant Review, review, Street food, Take away, Takeaway, Wales.